Today’s post is dedicated to the Damask rose, the absolute rose fragrance, sweet, luxurious, simply divine! The flower which actually is the Persian ambassador of passion and love since the ancient times - inspired even the Persian poet Saadi of Shiraz to write the famous work Gulistan (The Rose Garden). Our beloved rose was transported to Europe during the Crusade and today is cultivated in Iran, China, India, Turkey, Bulgary and Russia. It is one of the oldest varieties, while throughout the Middle East the Damask rose is mentioned as the most perfect of all flowers, being the symbol of faith and love. Rose of Damask has a complex chemical composition with many biologically active ingredients that have beneficial effects on various skin problems. It fights the signs of aging as it tightens the facial muscles and reduces the skin's relaxation. It offers rich and deep hydration in dry and cracked skin. Special guests: rose wax, a floral wax which is a complex of fatty compounds from extracts of aromatic roses. It consists predominantly of fatty acid esters, fatty alcohols, aromatic and colouring molecule from the flower of the rose. It is easily emulsifiable and enhances the aesthetic and physical properties of a formula. It protects and softens the skin, fights free radicals, cleans and detoxifies and has antioxidant properties. It is used in anti-aging products, facial-body emulsions, balms and even soaps. It is ideal for all skin types and especially for sensitive, dry and dehydrated. We couldn’t speak of a rose balm, however, if I couldn’t give the corresponding deep-red shade, the perfect red colour which is extracted from a strange herb, popular for its red colouring: the alkanet root! The ruby colour of the plant’s root is due to alcaninne which is solute in vegetable oils, floral waters and alcohol. Traditionally, alkanna was used to colour wines or give an vintage look to corks or even colouring clothes. Last years is very popular in the task of handmade cosmetics because of its colour which is used in lip balms, leaving a soft pink shade on your lips, in blushes for slightly pink cheeks or even in creams, lotions and soaps because it also treats and heals skin issues like sores, burns, eczema and irritated skins. Before you start making the lip balm, you sterilise tools, equipment, working surface and you wear your gloves. 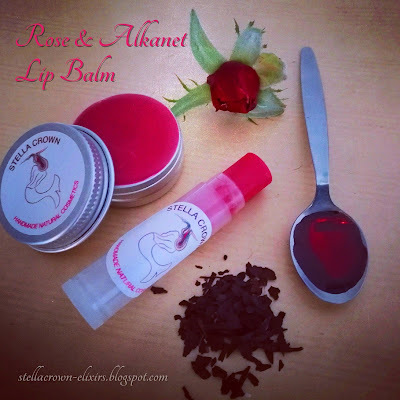 To proceed the preparation of rose lip balm, follow the instructions for the alkanna oily extract which are here, while the instructions for the rose infused oil are here. Pour the alkanna infused oil, the shea butter, the cocoa butter, the rose infused oil and the rose floral wax into a beaker. Place the beaker in double boiler (bain marie) with a low-temperature heat and wait the mixture to melt. Stir thoroughly with a stainless whisker and remove the beaker from the heat. Add honey and vitamin E to the mixture. Finally, add the essential oils and stir again. 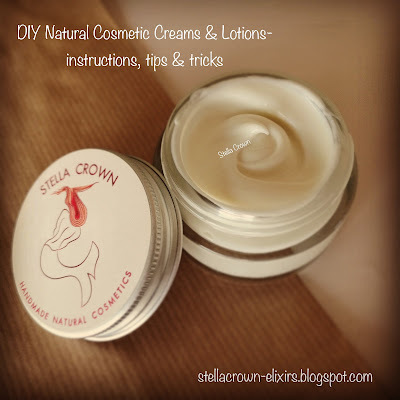 Pour the balm in jars or lip sticks and don’t close them with the lid before it completely cools down. Shea butter hydrates deeply, giving a natural and shiny appearance, cocoa butter retains elasticity while rose infused oil gives a silky texture to your lips. Honey heals and softens, vitamin E fights dryness, while just 2 drops of rosa damascena essential oil are superficial to give the final touch to a rosy balm, both in properties and fragrance.